History is tricky. We live through it, making our little impressions upon it, eroding it and yet preserving it in some ways. At the same time, we wish to consume it by observing it, recording it and experiencing it. The two are not mutually exclusive and yet are not completely in congruence. Nevertheless, some people manage to bring the two aspects together in a wonderful synchronisation. This past Sunday, in the early hours of the morning, a few aficionados of photography, some connoisseurs of art and culture and a few of those who are interested in history assembled in one of the by-lanes of the old Agra city (built and developed during the medieval period, Mughal period to be more precise) for a unique experience of a heritage walk. 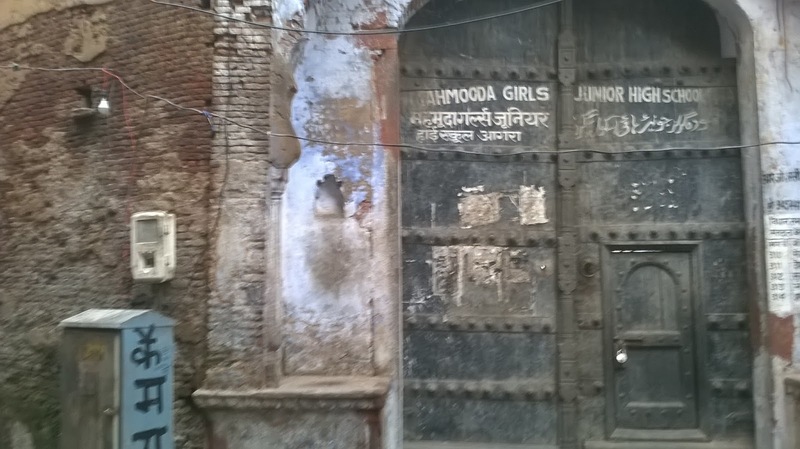 Led by Tahir Ahmed Qureshi, a filmmaker based in Agra, who also happens to live in this part of the city, the walk was a guided tour of the old Agra city, walled amidst such iconic monuments as the Agra fort and the Jama Masjid. With little bits of history that Tahir shared with the fellow travellers, the walk was like a jigsaw puzzle coming together with pieces of history from past and those from the present to create a beautiful sense of nostalgia for what used to be and a realisation of how it stands today. Following are some of the pictures which were taken along the way. The captions are reflections of what was understood and remembered along the way. Notice the asymmetry caused by a missing minaret in the centuries old Jama Masjid of Agra, a glaring fact largely unreported and perhaps unacknowledged. The Agra Fort Railway Station separates the Jama Masjid from Agra Fort. Modernity disrupting a moment in medieval history. The arches that frame history. A relatively new phenomenon as new brides come to imprint their hands on a wall (A Hindu tradition) in the Jama Masjid mosque, perhaps waiting to become a long standing myth soon. As the walk draws to a close, the serene Jama Masjid lets you capture it one last time. The drains are lined with the red stone indicating their historical legacy from the medieval period. A template of different colours is a regular feature in these streets. The dog couldn’t be bothered less though. As the dog yawns in the early morning hours, a rare sighting of a tree in the entire area. A novel way to urge people to keep the surroundings clean, appealing to a sense of communal ownership of common spaces. Also notice a contrast of modern day bricks on the left of the picture with the old “kakaiya” bricks on top. Imperialism is an inalienable part of all our histories. But it too can be witnessed from different perspectives. Iconic monuments like the Taj Mahal and Agra Fort amongst others are a testimony to the grandeur vision of the Mughal emperors. However, as Tahir suggests, to view these in isolation gives you an incomplete picture. These monuments, according to him, should be viewed in conjunction with the history of the city that grew alongside them. As Opinion तंदूर once pondered how iconic monuments today stand forlorn and empty as all their imperial functions and objectives couldn’t withstand the test of time, the cities that grew alongside as witnessed through this heritage walk, still thrive albeit with changing contours. The walk was a part of Sahapedia initiative. Tahir along with some of his fellow art, culture and history enthusiasts, is currently developing a collaborative space for artists in Agra.